If there were one word to describe the music Nick Zammuto made with The Books, his now sadly defunct experimental electronic-folk project, it would have to be ‘precision.’ The group’s cut & paste mix of found sound, slick production and impressive musicianship always conveyed a feeling that every string pluck, electronic blip and off-kilter editing trick was intricately placed with purpose. Now, with his new project, simply known as Zammuto, he’s applying that same precision to a more full band and song-based approach. Zammuto. Photograph by Melanie MacTavish. 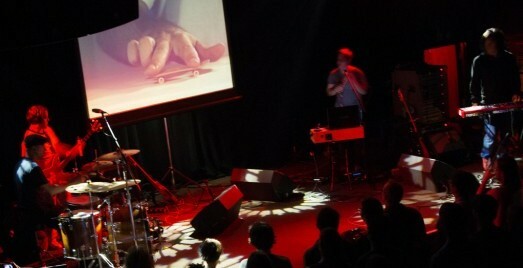 Another big element of Zammuto’s live show is the use of projection screen visuals. Meticulously edited videos accompanied every track, sometimes mirroring the scattered abstraction of the music, while other times juxtaposing it with funny clips of finger skateboarders, low budget infomercials and home video footage of Nick and his brother Mikey (Zammuto’s bass player) growing up. The best use of visuals was probably the video of a man performing a Civil War hymn on autoharp. Spliced together in glitch-y fashion, the performance rhythmically matched the tweaked-out version that the band played in front of it. Another inspired—but slightly less rewarding—cover came in the form of Paul Simon’s “50 Ways To Leave Your Lover.” The group nailed the verses, playing them straight and effectively, but tried to unnecessarily rearrange the choruses, unfortunately killing the momentum of the song. 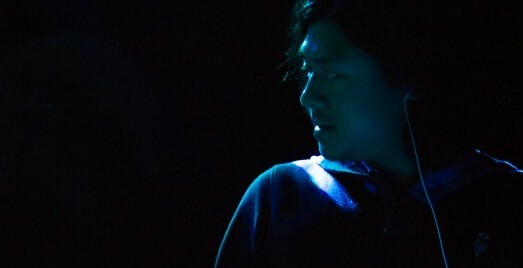 At the end of a brief encore, Zammuto treated fans of his prior project to a rendition of “Smells Like Content,” a highlight from The Books’ 2005 album Lost and Safe. Relatively stripped-down compared to the rest of the evening, the song’s sparse strums and delicate finger-tapped guitar melodies made for both a beautiful come down and a successful end to a solid set. All Photos by Melanie MacTavish.